The event module is intended for those who work with conferences, meetings, seminars, workshops or other events. Our goal is that you should be able to manage everything in the same system, and gather your work in one single place. That's why EventOnline handles subscriptions, cancellations, payments and your surveys. Before the participants arrive, you can print their name tags or personal schedules from the system. An example of an event form. List of participants in an event. 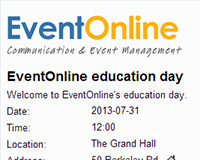 EventOnline manages subscriptions flexibly through customized web forms in your newsletter, on sites or through e-mail. You can print your participant lists, also with each participant's personal schedule or preferred add-ons for an event. There's a possibility to export participant information to the formats Excel, Text, CSV and HTML. Using the subscription form's customizability, it could work just as well as an expression of interest form, for collecting information or perhaps a job application form. All that's required is to remove location, date and time from the subscription form. If an event costs money to participate in, all you have to do is add how the participant should pay to the subscription form. In EventOnline you can choose between paying by card or invoice. You can also customize a participant's eventual add-ons, which are then summed up before payment. We cooperate with DIBS for online payments. Your communication through e-mail regarding subscription, unsubscription or change requests can be designed so that it is done using an event's or your own design. This can be useful if one has arranged a gala with one visual style and a conference using another. You don't have to start over from the beginning when you wish to recreate an event. Start off with an existing event instead. The system calculates and schedules the linked activities according to the new event's start date. This saves a lot of time. There are tools to simplify the creation of your subscription forms. You can have several different types of forms and visual identities for different occasions. Based on your participants information, it is possible to print personal name tags. If you cancel an activity, you can swiftly mediate this to all participants through e-mail or SMS. To make the creation of your subscription form easier, there are 16 pre-defined standard fields available. 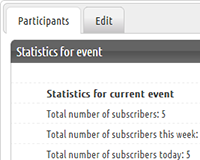 For each event you can set publish date, last subscription date and last date to unsubscribe. 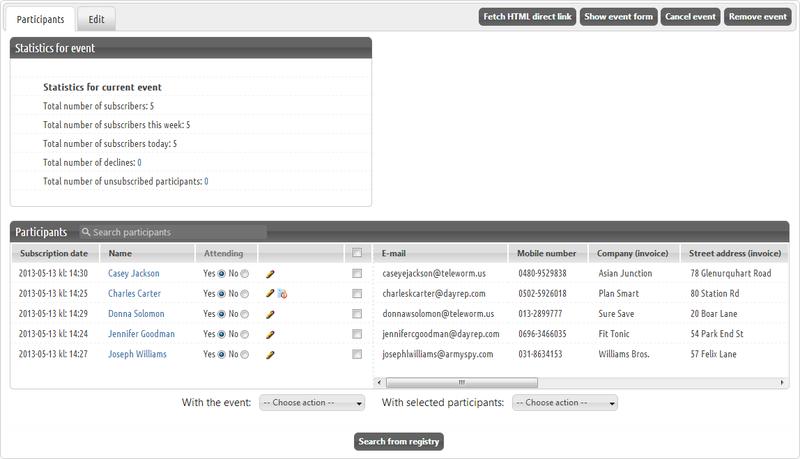 You can also create an event for recurring activities, e g. for your monthly- or weekly meeting. You can create custom fields in subscription forms so that they fit your activity. Custom fields can be created as for example multi-choice answers, which can be used to gather a participant's personal preferences regarding an event, or tailor programmes for different seminars and such. When subscribing, your participants may register additional information, such as food orders or allergies. For the international events, you can select english as your default language. With this function, subscription forms and all communication will be displayed in english. When creating your event, you can add reminders or a welcome message through SMS which is sent out to your participants. Follow up on your activities through web surveys. You can choose if this should occurr automatically for your subscribed participants. If a event if fully booked the waiting que can be activated. Persons signs up for the que knowing that the event is full. But if a participant unregisters for the event the first person in the waiting que will be upgraded to participant of the event. This is done automatically and the persons in the waiting que do not need to keep track of their position in the que. Portal with opportunity gather all the organizations events on one and the same page. The event can be filtered based on categories and keywords, can serve as a education portal..
Webapp with the possibility to check in tickets using QR code or manual check-in.. Possibility to design an event tickets with the participant's specific event selection, for example selected seminar passes..